Swedish Viking-themed death metallers Amon Amarth recently unveiled the details of their ninth studio album. Titled Deceiver of the Gods, the epic offering of Viking-styled death metal was recorded at Backstage Studios in Derbyshire, UK, produced, mixed and mastered by Andy Sneap (Opeth, Megadeth, Exodus, Arch Enemy, Killswitch Engage). The cover art was, once again, completed by Tom Thiel and depicts a mythical battle between the Norse deities Loki and Thor (Editor’s note: The artwork looks partially like a scene from the movie, Thor). Fans will also recognize a special appearance on this album with Messiah Marcolin (Candlemass) providing guest vocals for eighth song, Hel (Whom in Norse mythology is the goddess of the dead and ruler of Helheim). 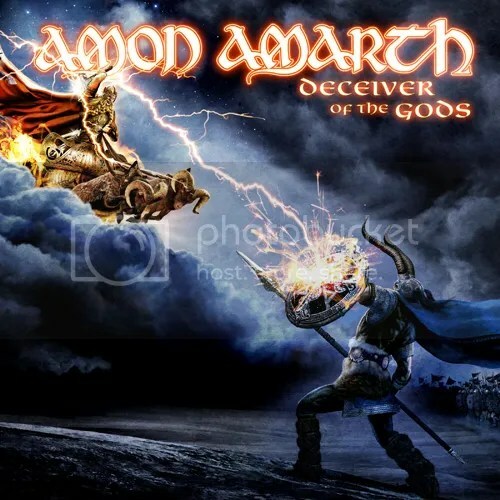 Deceiver of the Gods will be released in the UK via Metal Blade Records 24th June, along with the rest of Europe and the album will be released in Germany, Austria and Switzerland on 21st June. We feel very excited about this new album, and personally I feel that Deceiver of the Gods is the strongest album we’ve ever done. By far! I’m confident that all our fans will enjoy this ‘punch-in-the-face-of-a-record! Opening title track and first single, Deceiver of the Gods is currently streaming at the band’s official Metal Blade page, where you’ll also find special pre-order info. You can also listen to the track below. Described as a compelling synthesis of buzzsaw riff work, melodic harmonies and soul-severing rhythms punctuated by vocalist Johan Hegg’s callous Viking roar and gripping accounts of Norse battles and treachery, Deceiver of the Gods is the follow-up to the band’s critically lauded 2011 Surtur Rising full-length. Finding placement on multiple charts worldwide the record is among the band’s fastest-selling albums to date. Surtur Rising sold approximately 15,000 copies in the United States in its first week landing the band at #34 on the Billboard Top 200 and #1 on the Billboard Top Hard Music Albums. Around the world Surtur Rising also charted in Germany at #8 on the Top 100 chart, #19 on Canada’s Top 200 Chart, #12 on Austria’s Top 40 Chart and Switzerland’s Top 100 at #20. Amon Amarth will be opening the main stage of this year’s edition of the Rockstar Energy Drink Mayhem Fest set to commence June 29th in San Bernardino . Prior to that they’ll be at the 2013 edition Download, sharing the stage with the likes of Airbourne, Rival Sons and Limp Bizkit!